If you need to rely on public transportation to get around this evening, simply don’t — until further notice. 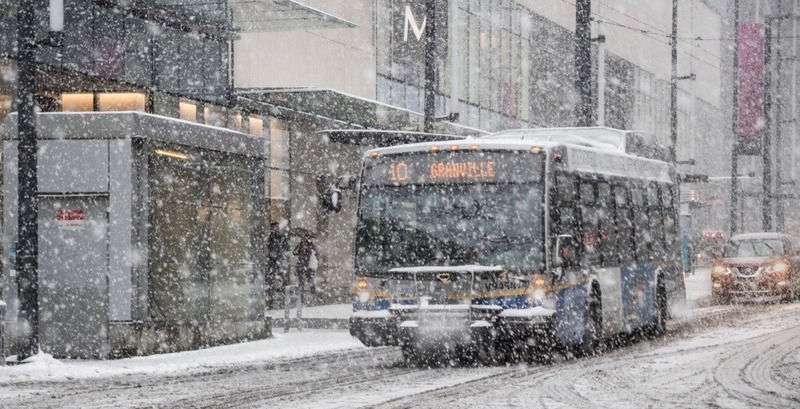 Nearly all major bus routes in Metro Vancouver are experiencing extremely lengthy delays due to exceptionally poor road conditions from the day’s heavy snowfall. For instance, as of late this afternoon, TransLink has been reporting delays of up to 90 minutes on the 99 B-Line and up to 60 minutes on the 95 B-Line. There are delays of up to one hour on the No. 16 Arbutus/29th Avenue Station route, which is normally operated by a trolley bus. And on West Broadway, just east of the intersection of Alma Street and West Broadway, at one point there were over two dozen buses lined up from end-to-end as they were unable to safely navigate up the unplowed steep hills on West 10th Avenue and Alma Street. A fleet of immobilized trolley buses were also parked on the Granville Street Bridge. Over two dozen buses were piled up on the south end of the bridge at one point. For the latest updates, visit TransLink’s website. There are also significant systemwide service disruptions on SkyTrain’s Expo Line and Millennium Line, including a shutdown of service between Braid Station and Lougheed Town Centre Station on the Expo Line. Environment Canada expects up to 10 cms in snowfall accumulation by later tonight. Further accumulations, along with frigid temperatures, are in the forecast for Monday as well.